Besides London, there aren’t many cities in this big bad world that I’m totally besotted with…but New York just happens to be one of these. From the splendor of Central Park, the artistry of MOMA, to the fantastically hip Williamsburg, it’s difficult not to be captivated by this city. And with a vast and vibrant culinary scene to match, New York absolutely suits me to a tee. I was recently in the Big Apple again to visit a good friend, and also had a schoolmate from Sydney fly over to meet me. I was so excited about this trip, that I started collating the EATlist even before I had actually booked the flight! OK…so perhaps my 17-strong list of restaurants over a course of 6 days was a little ambitious, but had the other half of Gourmet Belly been with me, I’m sure we would have made a fine attempt at nibbling the apple to the core. And it turns out; my travel companion was one hell of a picky eater. She rudely scrunched her nose up at some of the meals I had on the list, so all things Japanese, dumplings, and Vietnamese Banh Mi had to be eaten as a pre lunch/dinner snack – solo! So here are some eating and drinking spots which are worth a detour the next time you’re in the Big Apple. Our most memorable meals are given an individual feature in the next few posts, so filler up! Set in a former sausage factory in the Lower East Side, the team behind The Fat Radish (run by Brit duo Ben Towill and Phil Winser); have created a bit of a storm with their seasonal Modern British menu. 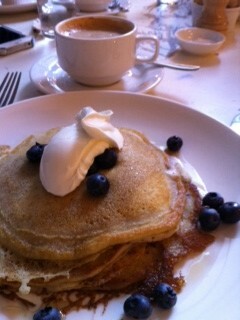 On our brunch visit, we had an interesting combination of blueberry and corn pancakes with bourbon syrup, which were incredibly fluffy; and some warm banana bread with very decent coffees. Sadly with a packed agenda that day, there was no time for a proper lingering brunch, but as our eyes wandered around the bustling restaurant, everything that came out of the pass looked mouth watering. Service here is warm and friendly, and they supposedly serve one of the Lower East Sides’ best burgers and chips cooked cooked in duck fat too! Despite the Banh Mi madness which has taken London by storm of late, I’m still yet to find anything remotely close to the incredible Vietnamese sandwiches we used to get in Sydney. I had heard good things about Baoguette (supposedly the best Banh Mi in Manhattan) so it was a welcomed sight when I we stumbled across their Wall St branch whilst visiting the 9/11 Memorial. I went for the classic Baoguette which contained ham (with pig’s ears for extra crunch), steamed pork roll, minced barbecued pork, pork liver pate, along with pickled carrots and daikon radish, thin slices of cucumber, and fresh coriander. With every bite, I was drifting back down memory lane…back to those days in Sydney where we’d get our made to order Banh Mi sandwiches from the local Vietnamese bakery. Absolutely heavenly…with a nice kick of chilli, that I think I stopped talking for a whole 20 minutes while I stuffed my face. Needless to say, my friend refused to take a bite out of this porky goodness. In fact, she started retching in the store as she read the ingredients. I believe it may have been the “pig’s ears for extra crunch” that was too funky for her belly…Seriously…I don’t really know how we are even friends. Renown for their bespoke cocktails and extensive whisky list, we dropped by Ward III for a night-cap after a wonderful meal at Marc Forgione. 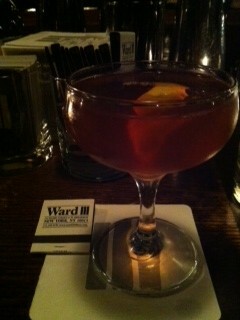 And when the friendly staff suggested that Ward III was one of the best cocktail bars in TriBeCa, the deal was sealed! The dark woods and dim lighting provided a 1920’s vibe, but unlike the Prohibition times, the only ban taking place here in Ward III is the ban of badly mixed cocktails. The bespoke drinks are made based on the customers combined preference for texture, flavor, spirit, fruit and spice, and then it’s all left to the very capable hands of the bartenders armed with their muddle sticks. At $12 a drink, my request for a “French Martini” yielded an even more delicious (and lethal) variation of the classic concoction – topped with an orange rind. My friends “I love whisky” statement provided a couple of samplers of Ward III’s whisky selection, followed by an 18 year old single malt whisky served on the rocks. The history behind this particular whisky, banter and impeccable service by the attractive bartender came for free. Word has it that this bar is incredibly popular with the locals, so best to get in early to nab yourself prime positioning at the bar. Since opening in June last year, Le Bain has been synonymous with A-listers, fashionisters, hipsters from abroad and wannabes, all dressed to impress. And on the night we went, it didn’t seem to differ much from their usual nights, minus the A-listers. Usher was spotted dropping in, two nights prior during New York’s Fashion Week! The DJ on the night was fantastic, spinning some funky house and mixing it in with some old school dance tracks, that it was almost impossible not to get on the dance floor and shake what our Mama gave us…And so we did…until 5am in the morning!! So it’s a little pretentious, and some might say a little bit w@nky, but the perfectly shaken French Martinis, incredible 360 degree views of the city on the rooftop, complete with astroturf, and waterbed-like furniture makes you understand what the fuss is all about. It is the Meatpacking District after all, so dress a little smarter than usual, and for gents, come in smaller groups, or armed with gorgeous ladies hanging off both arms, and you should be fine. New York designated the apple as the official state fruit in 1976.